Alex won 'The Most Valuable Player Award' for Premier Seconds One Day Comp and shared the award for 'Most Valuable Player' in T20s. 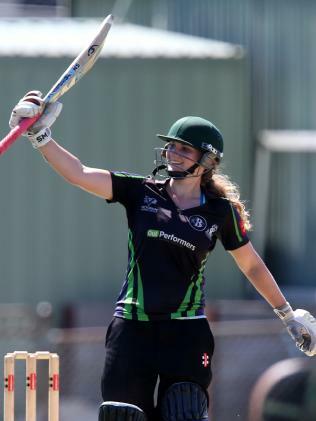 Her success is driven by her determination to lead Carlton-Brunswick into the top tier of Women’s Premier Cricket. The Strikers First XI compete in Women’s Premier seconds, where they took out the one-day title and reached the Twenty20 final in 2016-17. This summer they finished Runners Up in both. The English all-rounder has been pivotal to Carlton-Brunswick’s success, compiling more than 1000 runs and taking 20 wickets since joining the club last season. The 26-year-old grew up in Amersham, northwest of London, progressing to play for county championship side Berkshire. She first ventured to Australia five years ago, playing in Western Australia for South Perth. “The aim is to get Carlton-Brunswick into Premier ones,” she said. Rogers said she had considered moving permanently to Australia, which could boost her hopes of playing in the Big Bash League. “It would always be great to take my cricket as far as I can,” she said. “I work hard at it and I enjoy it.